Colony defense is a necessary but dangerous task for social insects, and nest defensive behaviors often lead to a premature death of the actor. 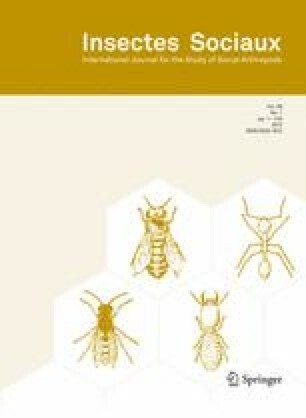 As an extreme form of colony defense, self-sacrificial behaviors have evolved by kin selection in various social insects. Most self-sacrificial defensive mechanisms occur in response to an acute threat to the colony, but some behaviors are preemptive actions that avert harm to the colony. Self-sacrifice has also been observed as a form of preemptive defense against parasites and pathogens where individuals will abandon their normal colony function and die in self-exile to reduce the risk of infecting nestmates. Here, we provide an overview of the self-destructive defense mechanisms that eusocial insects have evolved and discuss avenues for future research into this form of altruism. We would like to thank Matt Ginzel, Lauren Brierley, our editor, and two anonymous reviewers for helpful comments on the manuscript. O.R. was supported by a research grant from the North Carolina Biotechnology Center and the US National Institute of Food and Agriculture (AFRI grant #: #2010–65104-20533).